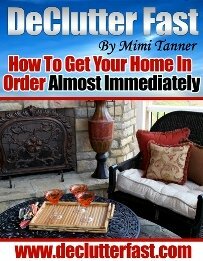 So you want to tackle organizing kitchen cabinets but you’re not sure where to start? Well, don’t start by emptying every single cabinet in your entire kitchen. If you do, you’re going to feel overwhelmed and cause yourself a lot of stress. Before you touch a single thing, think about where things belong in the first place. When organizing kitchen cabinets, you need to think about the various stations in your kitchen and what is done in each area. Based on that, you can decide that glasses and plates should go in a particular cabinet, spices should go in another, canned goods in another, and so on. Put a post it note on each cabinet to help you think it out. Visualize how your kitchen runs on a regular day… what do you need access to, how often, and where is most convenient. Once you’re satisfied with your choices (which can always be changed and modified as you go) you can begin to empty your first cabinet. The second part of organizing kitchen cabinets is to remove everything from the cabinet and wipe it down. As you’re taking things out, be sure to toss anything that’s expired or that you haven’t used in a very long time and don’t see yourself ever using again. Then put the new items in the clean cabinet. Repeat for all your cabinets. Take your time and do a cabinet or two at a time so you don’t get overwhelmed. Put items you don’t use often in the back of cabinets and drawers, or up high in cabinets, leaving the more easily accessible areas available for regularly used items. Group canned goods together with the labels facing forward. For boxes, turn them so a side panel with the product name on it is facing out. Organize packets of seasonings and gravy with a plastic bin or other container to prevent them from falling all over your cabinet. Don’t waste vertical space! Just because there are only two shelves in your cabinet doesn’t mean you can’t have more. Most likely, there are adjustable holes on the sides of the cabinets. You can purchase additional shelf holding tabs and a new piece of shelving. Your local hardware store should carry finished shelving you can cut to length. Use shelf racks to give you more shelf space and to store items of different heights on the same shelf. This is great for storing tall items on one side and two levels of short items on the other (See photo). Group like items together. For example, put all your baking goods together in one cabinet, snacks go together, cereals, canned goods etc. Group things in a way that works for you and how you use these items. Install sliding shelves or wire baskets that slide out to help make use of all the space in deep cabinets. You’ll have more usable space by being able to easily slide the items forward to better see and reach what you need. For corner cabinets that are difficult to get into, think about installing a Lazy Susan. This will allow you to spin items around to the front when you need to reach them. 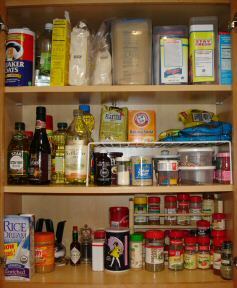 You may also consider small Lazy Susan’s in other cabinets, such as for spices. Consider tiered shelving units to help stack cans so you can read the labels easier. Or, just double stack cans, labels facing forward, and keep the same item in each “column”, front to back of the cabinet. If you have the option, install sliding shelves to put your pots and pans on along with their lids. If you must stack your pots and pans in a cabinet, consider how you will organize the lids. Try a hanging rack in the cabinet, or placing them on their sides in a wire rack that holds them up. If you have a lot of baking pans, you might want to consider storing them on their sides so you can slide them in and out. This helps you to find the pan you want easier without having to pull out a heavy stack of pans. If you have a drawer under your stove, that’s a great place to store that broiling pan and other flat items such as extra racks and pans for your toaster oven. Keep all your disposable dinnerware together so you can find them when you need them. I only use ours for get-togethers, so I keep them all together in a high up cabinet. If you use them regularly, make sure you find a convenient spot that everyone can reach. The task of organizing kitchen cabinets shouldn’t be so daunting if you take a little time to plan ahead, follow these tips, and tackle only a couple cabinets at a time.